i came across your site a few months back when i was looking for a vintage bike to get going and possibly turn into a mild cafe project. this was after i already acquired a Yamaha 200 Electric (mine's blue) that was siezed up. my dad had an R5 and i was sort of looking for one. so, i thought your site was pretty awesome. anyway...then i went to your root site and found that you basically have the career i'd love to have in a few years. i'm a 5th year industrial design student studying at KU in lawrence, ks. yes, the city i live in is your first name! a business associate of mine and i just started a web dev. business at deepthoughtdesign.com specializing in dynamic sites. 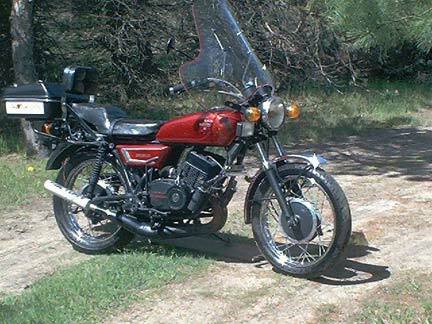 so, i gave up on the yamaha and bought this 1972 honda 350 for $300 and i've been tinkering away....it's great fun. First off, the Yamaha 200 Electric looks rather similar to the R5 (in fact, very similar to the later RD), cosmetically differing only in the tank, seat and sidecovers... seized up though? Have you gotten it going yet? Anyway, thanks for writing in and sharing! Yamaha factory racers will be painted in the old yellow and black scheme of yore when they race this weekend at Laguna Seca. These colors haven’t been used since the 70’s! All part of the celebration of Yamaha’s 50th anniversary. I dig it. Yamaha’s Factory MotoGP team goes to this weekend’s United States Grand Prix in celebratory mood, wearing the famous Yamaha USA colours of yellow, white and black. This special livery marks Yamaha’s 50th Anniversary and acknowledges the significant contribution made by American riders to the marque’s racing history. The Yamaha Motor Company was founded on July 1st 1955, just two weeks before the factory’s first bike, the YA1, won its first race, the Mount Fuji Ascent race. Since then three American riders have won nine premier-class World Championships with Yamaha – ‘King’ Kenny Roberts, Eddie Lawson and Wayne Rainey, each taking three crowns across three decades, the 70s, the 80s and the 90s. The livery that Yamaha Factory Racing YZR-M1 riders Valentino Rossi and Colin Edwards will wear at Laguna Seca was first used by Yamaha USA in the late 1960s and won global renown when Roberts scored his World Championship hat-trick. Hello all. Posting has been somewhat sparse lately, as things have been pretty busy. Not much riding is getting done, as the bike is still out of sorts electrically, and now is past due for inspection. Hopefully I can rectify it all this weekend. I REALLY ENJOY YOUR WEBSITE. BEING AN OLD R5 & RD FANATIC. THIS IS A PICTURE OF MY 1970 R5. IT HAS BEEN CUSTOMIZED OVER THE YEARS, HOWEVER THE BIKE HAS BEEN ALL OVER THE COUNTRY. IT NOW REPRESENTS AN AMAZING 47000 MILES ON IT. IT HAS BEEN TOP ENDED ONCE. IT HAS SAT ON TOP OF PIKES PEAK, BEEN IN MEXICO, THROUGH OUT THE COMPLETE WEST, FROM SOUTH DAKOTA, TO WYOMING, AND THROUGH OUT THE MIDWEST STATES. IT HAS PERFORMED FLAWLESS IN ALL THE LONG DISTANCE TRIPS OVER THE YEARS. ITS AMAZING THE LOOKS YOU GET GOING DOWN THE ROAD AT 70 MILES AN HOUR BY PASSING BIKERS AND CARS. OR YOU STOP IN A GAS STATION TO FILL UP AND THE STRANGE LOOKS YOU GET FROM THE SOUND OF IT. BUT YOU ALWAYS RUN INTO THE NOSTALGIC BIKER WHO WANTS TO SHARE HIS R5 STORIES WITH YOU. THANKS AGAIN FOR HAVING YOUR WEBSITE. I JUST WANTED TO SHARE MY EXPERIENCES WITH YOU. Wow - good for that little R5! I love hearing about vehicles that get used, that get taken all over the place - I mean, there's just something about trailer queens that irks me. But I hear you about the strange looks - here in the city, you either see Harleys or crotchrockets... so when you pull up on a vintage looker that sounds like a dirtbike, you manage to turn a few heads. And more than a few bike owners admit to owning an R5 or two in their day... it seems to have been the starter bike for a whole generation... Thanks for writing in! Hi, my names Glen, I'm in New Zealand and I'm doing up an 1975 RD350/400. It's got bits from both bike on it, seeing as it's already a mongrel, it means I can do whatever I like to it, with felling guilty about ruining it's originally. I've got some clip on bars for it already as I'm looking at going cafe style on it. The seat pan is screwed, so I'm making a whole new seat for it. It should be getting new Chrome and some powdering coating in a few weeks. The engine is seized too. I'll keep you posted on how it all goes. Here's a pic of the beast, I think you'll agree, I have more work cut out. See, Glen has a good situation on his hands. He's got a good bike, but one that needs work, so now he has free reign to hook it up in any style he deems necessary. I'd love to chop some things off and mix parts up, but when you have a bike that's more or less complete and looks good stock, it's hard to justify. So Glen, you do have a fair chunk of work cut out for you, but you also have quite of chunk of fun ahead too! Getting some clip-ons on there, getting some cafe flavor can really enhance the Yammy and sets it apart from the usual stuff. Keep us posted!